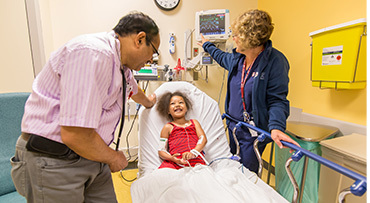 This guide will provide you with a basic understanding of the heart catheterization procedure at the University of Chicago Medicine Comer Children's Hospital. Our staff will do everything we can to answer your questions and to make your child's experience as comfortable as possible. If you have additional questions after reading this material, please speak with our cardiac nurse or contact our office at 773-702-6172. Heart catheterization (or "cath") helps cardiologists gain information needed to fully evaluate a condition and recommend treatment for your child. It is a test that shows how the heart chambers, valves, and vessels are formed, and how they are functioning. A cath also provides cardiologists with information about specific areas of the heart and lungs. For patients who need surgery, a cath provides surgeons with detailed information that is not available through other testing, such as the precise location of abnormalities and the specific structure of your child's heart. A heart cath may also be used therapeutically to treat a condition or to correct a problem. If your child has a fever, cold, flu, severe diaper rash, or exposure to any contagious disease during the week prior to the cath, check with your child's cardiologist or cardiology nurse before coming to the hospital. It is important to discuss with your cardiologist the timing of any medications your child is taking. Your child should eat a good meal, have a bedtime snack and get a good night's sleep. Your child may not eat or drink anything, including water, after a certain time. Please check with your care team to learn more. The cardiology nurse will call to tell you what time you should arrive at the hospital. Do not give your child any medications, prescription or over-the-counter, unless your cardiologist has previously given you approval. Prior to the cath, your child will receive a physical evaluation. A chest X-ray, EKG and echocardiogram may also be performed if they have not been already. Arrive at the hospital at your designated time and proceed to the check-in location you've been given. You and your child will be escorted to the cath waiting room. Your child will then be taken to the adjacent cath lab where the procedure will be performed. When you arrive at the hospital, proceed to the check-in location you've been given. 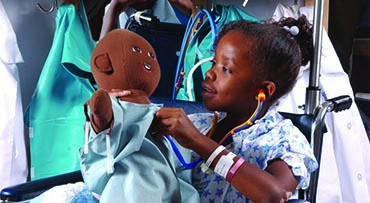 The nurse will take your child to the cath lab where the procedure will be performed. You may see your child immediately. Your child may be drowsy and/or sleep for a few hours. During recovery, your child will be placed on a heart monitor until they are completely awake from the sedation. A nurse will frequently check vital signs (temperature, pulse, breathing, blood pressure), circulation, the heart monitor and the pressure bandage placed over the cath insertion site. Inpatients will be closely monitored by their primary nurse. Your child should rest until they are fully awake and the cardiologist gives approval for them to move around. A urinal and bed pan will be available for your child to use. Once fully awake, your child may drink clear liquids and juices provided by the nurse. If nausea or vomiting occurs, discontinue the liquids until the symptom subsides. Before you leave that day, the cardiologist will discuss the preliminary results and recommended a treatment plan. This plan will be finalized after review by the cardiologists and surgeons at the cardio-surgical conference. Most outpatients are discharged later in the afternoon or the evening of the procedure. 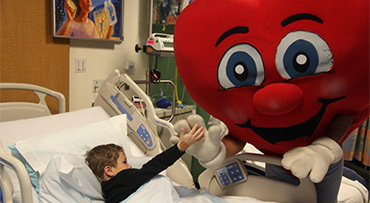 Occasionally the cardiologist may decide to admit a child as an inpatient for further observation or treatment. Otherwise, your child may leave the hospital in your arms or in a wheelchair after the conditions listed below are satisfied. Take clear liquids without vomiting. Exhibit no bleeding or other complications at the cath insertion site. Receive physician approval to go home based on a physical examination. Review discharge instructions with the nurse, making sure to focus on when resume your child's cardiac medications. Discuss the cath results and follow-up treatment plans with the cardiologist. It is important for your child to remain in bed or on the couch until the morning after the cath. Getting up briefly to go to the bathroom is permitted. The morning after the cath, remove the pressure bandage from the groin area and apply a Band-Aid, if this has not already been done. Keep a Band-Aid over the cath site for two days after the test. Remove the Band-Aid each day to check the site for infection or bleeding. Then reapply a clean bandage. Give Tylenol for pain or fever, if needed. Refrain from tub baths or swimming for three days after the test. Showers or sponge baths are permitted, but the site should be kept as dry as possible. Permit only mild activity on the day after the test. Strenuous exercise or participation in sports is prohibited for three days after the test. Resume normal activity three days after the test. It is unlikely that any problems will arise after the cath, but if you observe any of the following, call your cardiologist. Bleeding from the cath site is abnormal and can be stopped by firm pressure on the site. Apply pressure for 10-15 minutes and notify your cardiologist immediately. If bleeding does not stop, take your child to the nearest hospital emergency room for treatment and notify your cardiologist immediately. A small amount of bruising and minimal discomfort at the cath site is normal and will go away in a few days. Swelling, redness, pus at the insertion site, severe discomfort or significant pain upon walking should be reported to your child's cardiologist. A slight fever is common after cath, but should not last longer than 24 hours. Any fever of more than 100 F in the week following the cath should be reported to your child's cardiologist. Continued nausea should be reported to your child's cardiologist. For questions or problems, call 773-702-6172. Pediatric cardiologists are available 24 hours, seven days a week. After regular business hours, our answering service will contact the cardiologist on-call immediately. A cardiology nurse is available from 8 a.m. to 4:30 p.m., Monday through Friday.